When I read Jeff Jackson’s 2013 novel Mira Corpora, it blew my mind. It felt so of its moment, in terms of its literary heft: it was an experimental novel that was still friendly, beautifully written and designed, an exemplar of “indie lit” at a moment when independent presses were on the rise gloriously (its publisher, Two Dollar Radio, sort of cornered the market on this kind of adventurous literature back then). But it also felt somewhat of the mainstream, and not in a bad way. It came with a blurb from Don DeLillo, after all. How many debut novels can claim that? Clearly Jackson was onto something. Needless to say, I was eager to read his follow up, Destroy All Monsters, out last month. No longer with Two Dollar Radio, Jackson found a new home at a similarly adventurous publisher, FSG. Even though he’s stepped up to New York publishing (the Major League? ), his writing has lost none of its verve, its edge. A rock novel (“The Last Rock Novel,” it promises), Destroy All Monsters follows an epidemic: rock bands are being murdered on stage all throughout the country. Its central characters are young people trying to make their way as musicians. Jeez, poor things. It’s not enough that making art can lead to destitution and poverty: now it needs to lead, quite possibly, to death? Jackson’s writing is poetic, oblique. The book feels like music, like an old experimental rock record, right down to its format: read “Side A” and then flip over the book to read “Side B,” which reframes the central characters in surprising ways. The book is a triumph of warm-hearted avant-garde: yes, it may pulverize you, knock you down, but at least it’ll hold out a hand and help you back up. I asked Jeff Jackson some questions about Destroy All Monsters. Here’s what he said. Ben: While very different from Mira Corpora, Destroy All Monsters does seem like an extension of many of its preoccupations. Was Destroy All Monsters conceived of during the writing of Mira Corpora or after the writing of Mira Corpora (or, heck, even before)? Do the two books have any relationship to one another? 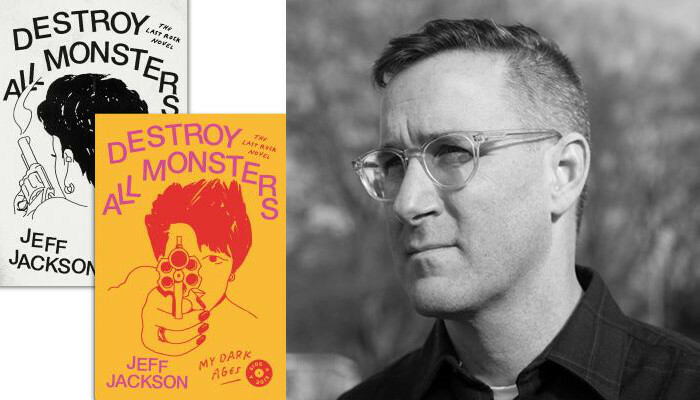 Jeff Jackson: The first images for Destroy All Monsters came when I was in the middle of writing Mira Corpora. Like that book, the world of DAM is heightened, though it’s a bit less hallucinatory. The two books absolutely share some preoccupations, such as ritual, forests, post-industrial landscapes, teenagers living without parents. As a younger writer, I tried to make my stories completely different from each other. My writing improved when I adopted J.G. Ballard’s philosophy of giving my obsessions free reign, trusting they’ll vanish when they’ve lost their power. BR: Destroy All Monsters positions itself as “the last rock novel,” but it’s a book where rock and roll still has a great deal of potency and danger. If this is, in fact, the last rock novel, does that also suggest the end of rock and roll—and, if so, what can replace its potency? JJ: There’s a great Silver Jews lyric: “Punk rock died when the first kid said ‘Punk's not dead.’” Maybe rock these days is perpetually dying—and reanimating itself. There’s still plenty of interesting rock and roll being created, though it doesn’t have the same cultural potency. This is a problem across all genres because music isn’t moving the cultural needle the way it used to. What’s replaced it? The internet, maybe? Social media? Nothing satisfying. BR: What writers do you draw from in your work? I remember the DeLillo blurb on Mira Corpora and he seems present here, especially structurally, with certain passages having a wandering eye similar to the first chunk of Underworld. What other authors speak to you—particularly those who have created other rock novels? In terms of other authors who speak to me—how much space do we have? Dennis Cooper’s approach to structure and sentences loom large. I thought a lot about how Alain Robbe-Grillet creates patterns and repetitions. The great Hungarian writer Agota Kristof helped me figure out the Side A/Side B concept. The way Ralph Ellison writes about music seeped into the book. I’m probably one of the few who prize Joan Didion’s fiction more than her essays. And Vladimir Nabokov’s novels (one in particular) are the presiding spirits of DAM. I wrote an article about some favorite rock novels for Electric Literature. From that list, the author who casts the longest shadow over DAM is Jaime Hernandez, whose Love & Rockets graphic novels I’ve been reading since high school. His depictions of the punk scene are peerless and he’s created more memorable characters than any other living American writer. JJ: I love the Low comparison and wish there were specific records that inspired the structure. I focused more generally on the nature of B Sides, how they’re stranger and more experimental, sometimes revealing a band’s secret obsessions. Structurally, I was also thinking about cassette tapes, imagining the two sides both erasing and rewriting each other. The loss of physicality—a Side A and Side B, among other things—is one of the things that’s stripped music of its potency. That’s why the design of my books is so important to me. With Destroy All Monsters, that includes how the text flips, the two covers, the way words are laid out on the page, the font sizes and white space, French flaps, etc. I want the book to be an attractive physical object, to feel like a totem. BR: If this is, in fact, the last rock novel, has there been a last literary rock record? Is that the flip side to this? JJ: If there’s a last literary rock record, it’s whatever Scott Walker did most recently—or what he’s currently recording. Scott Walker is the Samuel Beckett of rock, the supreme lyric poet of exhaustion and endings. At the opening of Side B of Destroy All Monsters, Xenie says: “There’s always something before the beginning.” Similarly, I suspect there’s always something after the end.